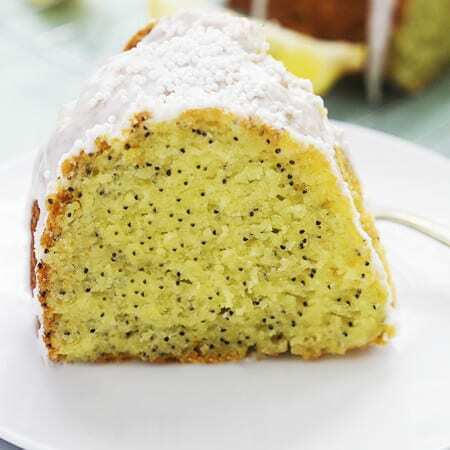 This super moist lemon poppyseed bundt cake is easy to whip up with the help of a cake mix and a few ingredients like lemon pudding and sour cream! Preheat oven to 350. Heavily grease a bundt pan and set aside. In a large bowl whisk together cake mix and pudding mix. Add sour cream, vegetable oil, eggs, and warm water and mix until all ingredients are incorporated. Stir in poppy seeds. Pour cake batter into prepared baking pan and bake for 40-50 minutes until an inserted toothpick comes out clean. Allow to cool 30-45 minutes before inverting cake onto a cooling rack. For the glaze, mix together powdered sugar, lemon juice, and milk (start with 3 tablespoons and add more as needed until glaze is pourable). Drizzle glaze over cooled cake. Top with sprinkles if desired. Store covered at room temperature. *I also love to use an almond glaze for this cake instead of lemon. Skip the lemon juice and add 1 1/4 teaspoons almond extract. Add just enough milk for the glaze to be pourable.